The Columbia County Democratic Committee held its 9th Annual Martin Van Buren Awards Event at Helsinki Hudson this past weekend. This year's esteemed Honorees are: Robin Andrews (Distinguished Service to the Party and Community), Leonard “Rocky” Brown (Leadership and Loyalty to the Democratic Party) and Katy Cashen (Distinguished Service to the Party and Community). Ernie Reis was also Honored (not pictured) earlier this year (Distinguished Service to the Party and Community). 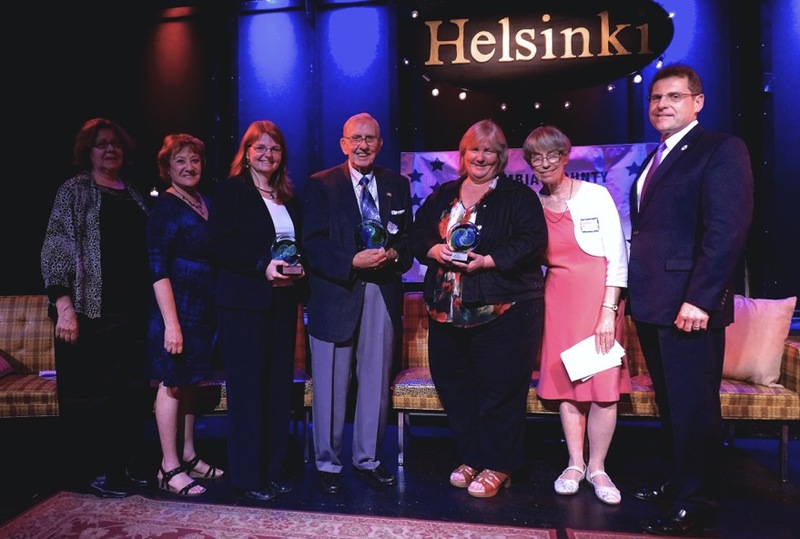 Pictured on stage after Honorees received their respective awards are (L-R) Angella Pace (CCDC Secretary), Stephanie Sussman (CCDC Events Committee), Robin Andrews, Leonard “Rocky” Brown, Katy Cashen, Debby Mayer (CCDC 1st Vice Chair) and Peter Bujanow CCDC Chair). Guest Speakers at the event included NYS Lt. Governor Kathy Hochul, Assemblymember - Didi Barrett, NYS Democratic Committee Chair - Sheila Comar, NYS Democratic Committee Executive Director - Basil Smikle and Democratic Rural Conference of NYS Chair - Irene Stein. The event was also attended by Congressional, State and regional candidates and elected officials.